This Web Site (hereinafter the "Site"), considered in its entirety and in terms of its individual constituent parts, as is all material contained within the Site, is protected by copyrights, trademarks and/or other intellectual and industrial property rights. These materials are owned by AitherCO2 SpA or its subsidiaries or affiliates, or used with permission of their owners. Such materials include, but are not limited to, the photographs, images, illustrations, text, video clips, audio clips, designs, logos, trademarks, trade dress and any other materials contained in this Site, as well as the software used in the design and development of this Site. All rights are reserved, worldwide. The name and brand AitherCO2 SPA, the ACO logos, the stylized letters ACO2 and all other marks that are characteristic of or identifiable with AitherCO2 SpA depicted in this Site, whether registered or unregistered, are trademarks or service marks of AitherCO2 SpA. The materials contained in this Site are displayed for informational and promotional purposes only. This Site is solely for private, personal, and non-commercial use. You may download or copy materials in this Site solely for your personal non-commercial use. You do not have any right, title or interest in any material or software as a result of any such downloading or copying. You may not reproduce (except for your personal non-commercial use), publish, transmit, distribute, display, remove, delete, add to, otherwise modify, create derivative works from, sell or participate in any sale of, this Site, any of the materials in this Site, or any related software. 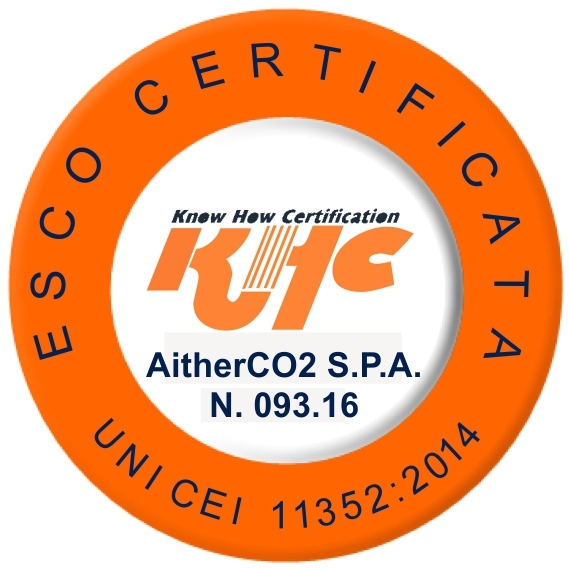 Any other use of materials on this Site, including reproduction for purposes other than your personal non-commercial use, modification, distribution or republication, without the prior express written permission of AitherCO2 SpA, is strictly prohibited. By accessing, browsing and using the pages of AitherCO2 SpA (hereinafter referred to as "AitherCO2") website (hereafter "the Site") the user (hereinafter referred to as "the User") accepts, without limitation or qualification, the terms and conditions herein. The contents of this Site, including data, news, information, images, graphs, documents, drawings, logos and domain names, are the property of AitherCO2 and, unless specified otherwise, are covered by copyright and by the regulations pertaining to industrial property rights. No license or right to use any of the aforementioned contents of this Site is granted to the User; no portion of this Site may be reproduced, copied, published or used in any form or by any means for commercial purposes without prior written permission from AitherCO2; Users are permitted to print or download extracts from this Site for their personal use only. The information contained on the Site is compiled from AitherCO2 internal sources, unless otherwise specified. AitherCO2 reserves the right to change the contents, function or operation of the Site at any time without notice. AitherCO2 makes every reasonable effort to ensure that the information and data on this Site is reliable, accurate, complete and up-to-date. In all cases, AitherCO2 assumes no responsibility and thus declines all and any liability whatsoever for any inaccuracies, shortcomings or omissions that may be found in the contents published on the Site, as may derive from material errors or misprints, data entry, formatting or scanning. This also applies to contents hosted on the Site compiled by third parties at the request of AitherCO2. AitherCO2 is in no way responsible for the contents of any other websites via which the User may - via a hyperlink - have accessed this Site or other websites linked to this Site, nor is AitherCO2 responsible for any lost profits or revenues, loss or damage to data resulting from use of or reliance on websites to which this Site may be linked. Furthermore, AitherCO2 takes no responsibility for the Site being temporarily unavailable, for delays in updating the information, or for damage arising from interruptions, suspensions, delays or anomalies in connecting to the Site as may be dependent on the power supply or telephone service or on Internet outages or any other causes beyond the control of AitherCO2. AitherCO2, and the Technical Departments that it authorises, make use of appropriate electronic devices and antivirus systems in order to protect the company’s Information System from the risk of intrusion and from programmes designed to damage or interrupt its operations. However, only the User is ultimately responsible for equipping the electronic devices used to browse the Internet with programmes and systems designed to ensure secure navigation in wireless networks and adequate protection against viruses and other damaging programmes.